Affleck, G., Tennen, H., Pfeiffer, L., et al (1987) Appraisals of control and predictability in adapting to a chronic disease. Journal of Personality and Social Psychology, 53, 273–279. Greenfield, S. A. 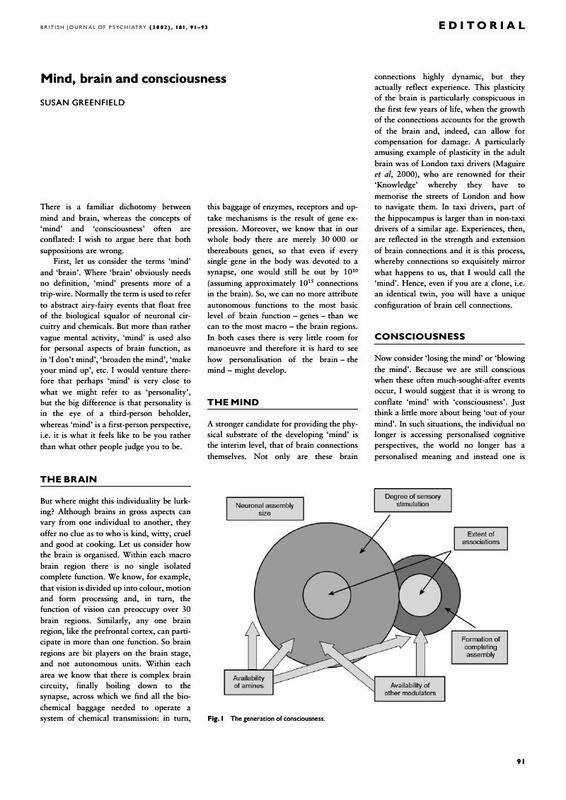 (2000) The Private Life of the Brain. London: Penguin Books. Guieu, R., Samuelian, J. C. & Coulouvrat, H. (1994) Objective evaluation of pain perception in patients with schizophrenia. British Journal of Psychiatry, 164, 253–255. Maguire, E. A., Gadian, D. G., Johnsrude, I. S., et al (2000) Navigation-related structural change in the hippocampi of taxi drivers. Proceedings of the National Academy of Sciences of the USA, 97, 4398–4403. Woolf, N. J. (1996) Global and serial neurons form a hierarchically arranged interface proposed to underlie memory and cognition. Neuroscience, 74, 625–651.